Who The Hell Are 'Vince And Kath' (And Why The Hell Are They Dominating Our Facebook Feed)? Filipinos love a good love story. Take a look at the recent Metro Manila Film Festival. Walang Forever and its stars Jennylyn Mercado and Jericho Rosales took home the festival's top honors, while My Bebe Love, which features the phenomenal AlDub pairing, are breaking local box-office records left and right. Majority of the other MMFF entries boast of their own romantic subplots and hit love teams (JaDine, in Beauty and the Bestie, for example). And now we have this: A certain Facebook page with a considerable amount of Likes (over 839,000 as of this writing) came up with a fictional love story, one that has now gone viral. Life and Social Media recently introduced Vince and Kath, whose tale of romance is currently making quite a buzz in the Pinoy social media scene. Basically, the couple's present-day love story mirrors millennials' "way of love" (with a dash of pabebe from both parties), so it becoming a hit among local Facebook users wasn't all that surprising. The advent of social networking and dating apps such as Tinder have made meeting people, albeit not physically, acceptable. 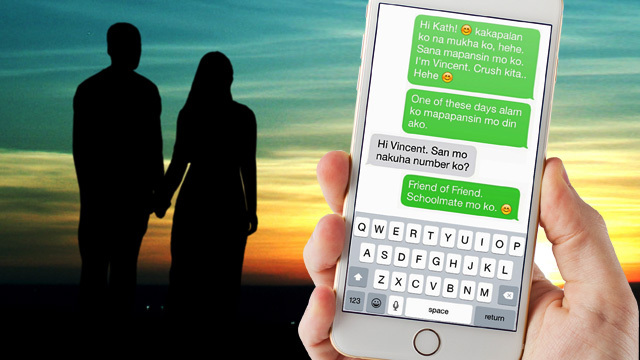 One is able to follow Vince and Kath's story and conjure up images just through simple text conversations and emoticons. While the elements and character personalities are indeed relatable (Jake as the friendzoned best friend trope, Vince as Mr. Varsity Player), the overall cheesiness in the story's initial chapters and the drama buildup in latter parts ultimately found its way into the hearts of the online fandom. With the way the post is circulating online (48,000 likes and almost 48,000 shares as of this writing), a Wattpad-type movie adaptation isn't too far-fetched, especially considering how quick producers tend to pounce on such a trend. On a side note, FHM stalked stumbled upon the creator of the text-fic (text fiction, because we're calling it that now), who is one of the administrators of the booming Facebook page. Too bad Queen Elly's social media accounts—Facebook, Twitter, Instagram—offer limited info.